Thermal pollution occurs when power plants and factories discharge hot or cold water into nearby rivers, lakes, streams, oceans or bays, causing rapidly changing water temperatures. Most marine organisms have specific temperature needs and are unable to survive sudden changes. Even small temperature changes may result in thermal shock to aquatic life, cause reproduction difficulties and lower disease resistance. Water temperatures usually change gradually as the seasons change. During cold seasons, when fewer food sources are available, fish metabolisms slow. When industrial discharges heat up the water, fish metabolisms also speed up, causing malnutrition due to insufficient food sources. Mass fish kills can occur as a result. Organic matter decomposes faster in warmer temperatures, depleting dissolved oxygen from the water and increasing bacteria levels. This causes an overabundance of organic nutrients. Aquatic plants grow at a faster rate in warmer waters, resulting in overpopulation and shorter life spans. 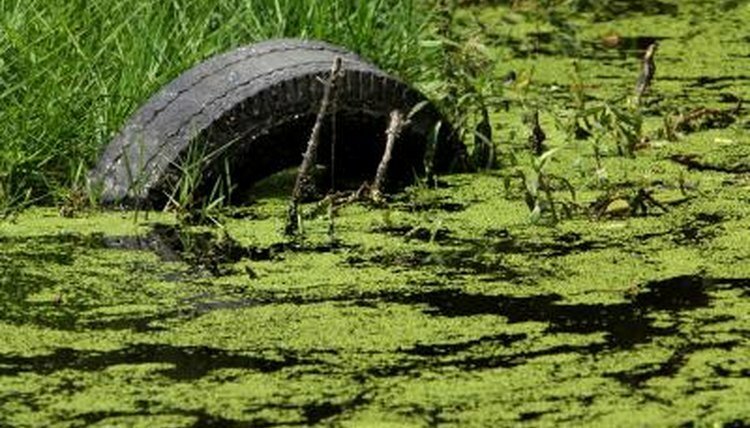 Algae blooms occur, choking fish gills and clouding the water. As the algae growth increases, other aquatic plants are unable to perform photosynthesis because of a lack of light. Corals and other marine life may die because of oxygen depletion. When water temperatures change, local marine life may be forced to migrate from the area, relocating to a more suitable location. Aquatic life from other areas may move into the vacated waters, giving rise to changes in biodiversity in both locations. Most thermal pollution is caused by the discharge of warmer water, but cooler water discharges also have a detrimental effect on aquatic life. Cold waters from the bottoms of deep reservoirs are emptied into warmer rivers. Plankton cannot survive the cooler temperatures. Many fish, their eggs and their fry may die. As some organisms die, others reproduce and take over, potentially changing the area's ecosystem.